With the development of NoC, it becomes an urgent task to efficiently map a complex application onto a specified NoC platform. 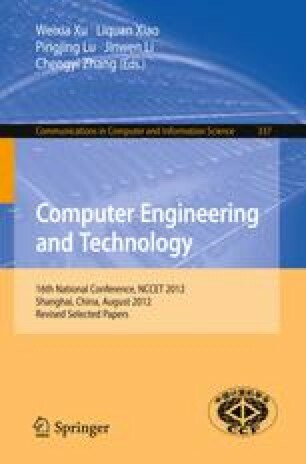 In the paper, an approach which is called constraint-cluster based simulated annealing (CCSA) is proposed to tackle the mapping problem in 2D-mesh NoC in order to optimize communication energy and execution time. Different from other methods, the relationship among cores that are patitioned into several clusters is considered in our method and according to the relationship constraints are set. Experimental results show that the proposed approach gets shorter execution time with lower energy consumption compared with others algorithms. In VOPD application (4x4), the reduction of execution time is about 75.64% combing the normal simulated annealing. In greater application (8x8 vodx4) the CCSA can save 68.89% . The energy consumption is the lowest among all the compared algorithms. This work was supported by the National High Technology Research and Development Program of China(No.2012AA01A301).